November 1807– Johann Senn, then twelve, starts at the Academic Gymnasium in Vienna and boards in the Stadtkonvikt. November 1808– Franz Schubert, then eleven, becomes a Sängerknabe, 'chorister', starts at the Academic Gymnasium and boards in the Stadtkonvikt. March 1820– Schubert and Senn are found together in Senn's room during a police raid. What happened in their friendship in those 13 years? Our only description of Senn in the Stadtkonvikt comes from an account written by Joseph Kenner (1794-1868) forty years after the fact on 22 May 1858. Kenner had been schooled at the Kremsmünster Stift. As a 17 year-old in 1811 he started his studies at the University of Vienna in Rechts- und Staatswissenschaft, Law and Political Studies, boarding in the Stadtkonvikt. Josef [recte Johann] Senn was in the Vienna Konvikt at the same time as Schubert, as were several other sons of the Tyrolean leaders of 1809. He was a wonderful, warm-hearted young man, strong in mind and body, a stubborn philosopher, open to friends and reserved with others, frank, passionate, a hater of all external constraint. His fate aroused my deepest, sorrowful sympathy: I can still see before me the young and passionate man he was then. The disciplinary punishment of a fellow inmate in 1814 or 1815, I think it was, stirred up a revolt by all of his other comrades, who wished to free him forcibly from his secretive imprisonment. Senn was involved, as was Rueskäfer, who is now Under-Secretary in the Finance Ministry. Rueskäfer voluntarily left the Konvikt straight away. Senn lost his scholarship because, although poor, he could not allow himself to he degraded by recognising the legitimacy of that punishment. Senn's free-thinking was suspect, his inflexibility seemed dangerous. I did not see him again. Schubert must have known him earlier in the Stadtkonvikt, later he must have seen him at Spaun's, Mayrhofer's – perhaps at Schober's. In their gratitude for any scrap of vague reminiscence from times long-gone, Schubert biographers are tempted to leave their scepticism to one side. Kenner's memoir is the only one which mentions the disciplinary incident in the Konvikt. Thanks to some archival research by the great Schubert scholar Otto Erich Deutsch we can look at this incident more closely. Deutsch quotes from the report of the Curator of the Konvikt, Josef Karl Graf von Dietrichstein (1763-1825) on 29 August 1813 concerning the 'punishable behaviour' of some pupils. This document has been loosely translated here in a way that leaves the bureaucratic circumlocutions behind. Report of the u.ö, Landmarshall, 'Parliamentary President of Lower Austria' and Konvikt Curator Graf von Dietrichstein from 29 August 1813 over the punishable behaviour of some boarders of the Konvikt in Vienna. On 19 August the Konvikt boarder and pupil in the year II philosophy class, Johann Bacher, violated the frequently repeated rule that he should not appear at evening communion in boots instead of shoes. He was given room arrest. Some boarders assembled with the aim of releasing him forcibly but were prevented from doing so. The group demanded his immediate release with defiance, insubordination, vehement threats and insults. The uproar arose after a conspiratorial meeting among the second and third year philosophy pupils of the Gymnasium decided to try to release Bacher. Some of those involved stood out as being the leading lights who directed their aggression and insults towards their Director. These pupils would be in the seventh and eighth years of the school programme and would be around 16 and 17 years old. These pupils were: Ferdinand Fischer, Leopold Ebner, Franz Sendl, Michael Rußköfer and the fee-paying boarder Graf Philipp von Engl. Eight other pupils were present but took no active part and were just silent companions and spectators. These eight have already been punished with a severe reprimand, they have in the past conducted themselves in a quiet and orderly manner and their superiors have been satisfied with them. They have not therefore received any further punishment. In the case of the five pupils named, the Director of the Konvikt has stated that Fischer, Sendl and Rußköfer are good in their studies but have the talent to do much better. They always behave in a very disorderly, rude and coarse way and thus lead all the other pupils astray. Their removal from the Konvikt would thus be desirable. During this incident Ebner was one of the rowdiest boys, although up to now he has never given the slightest hint of such misbehaviour. His normal conduct is very good, his schoolwork without fault – although he is capable of doing better. Graf Engl was the only one who recognised his error and asked for forgiveness. The fee-payer Graf Philipp von Engl should be given a room arrest on two recreational days. The Tyrolean pupil Leopold Ebner, who otherwise has behaved well and was only led astray out of sympathy for his fellow countryman Bacher should receive a four-day room arrest. The continued presence in the Konvikt of the three other pupils Ferdinand Fischer, Franz Sendl and Michael Rußköfer will only be to the disadvantage of the other pupils. Therefore in order to make a deterrent example for the other pupils they should lose their scholarships and be expelled from the Konvikt. Fischer had anyway wanted to become a soldier, had secretly visited the barracks but was not accepted. He has since asked his father if he could become a soldier. If he obtains that permission he will be expelled without further action. Finally, the pupil Johann Bacher should not be punished further, since he has completed the initial punishment given to him by the Director of the Konvikt and bears no responsibility for the disorderly behaviour of his fellow pupils. Before we look at this incident more closely we should note in passing that a relatively mild bit of rowdy disobedience by half a dozen adolescent boys in a boarding school has now involved the Director of the Academic Gymnasium, Franz Schönberger and certainly his boss, the Rector of the Konvikt, Innozenz Lang. The report writing skills of the Curator of the Konvikt, Josef Karl Graf von Dietrichstein, have been tested. He is a twig of one of the great Austrian feudal families and at the time was niederösterreichischer Landmarschall, 'Parliamentary President of Lower Austria', and hung with many other baubles. We no longer even feel surprise when we read the scribble at the end of the report: 'The highest decision. Your request receives in all points my approval. Franz'. In the Empire of Paperwork, even this report on school behaviour passed across the Emperor's desk. The first thing we now note about Kenner's memoir is that he recalls one of those expelled as being [Michael] Rueskäfer: 'Under-Secretary in the Finance Ministry. Rueskäfer voluntarily left the Konvikt straight away'. Hearing that Rueskäfer was involved in the uprising is a surprise, since he had a fine career in government. It appears likely that Kenner is confusing Michael Rueskäfer with Michael Rußköfer, whom we have seen from Dietrichstein's report was definitely expelled. Rußköfer is characterised as a lazy troublemaker. It is difficult to see how such a boy would have achieved Rueskäfer's stellar career. Kenner also tells us that Senn was involved in the rebellion, but there is no trace of his name in Dietrichstein's report. He may have been one of the 'silent eight' who merely received a telling off, but this is nowhere near Kenner's conclusion that 'Senn lost his scholarship because, although poor, he could not allow himself to he degraded by recognising the legitimacy of that punishment'. Senn may have left the Academic Gymnasium in 1814/15. We know that he continued his studies at the University of Vienna in philosphy and then law, financing himself through private teaching. We have to note that the disciplinary incident occurred on 19 August 1813. Senn's father Michael had died on 20 February of that year. 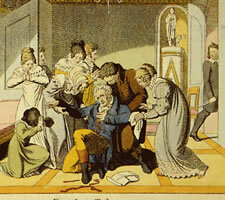 Although it is possible that Johann's time in the Vienna Konvikt was paid for by a scholarship, the death of his father would have certainly had financial consequences for the family. He may have had to leave the Konvikt in 1813 – in fact, he may not even have been there when the incident took place. Over a period of forty years in Kenner's mind, Senn's later principled stand against Sedlnitzky's police seems to have created a principled stand against his [non-existent] punishment by an arbitrary authority in the Konvikt. Lacking other sources we can only conclude that Senn was not involved in the uprising, perhaps not even present. That's it. Written in March 1858, this is all Sonnleithner cares to mention about Senn. It is clear that he knows much more about Senn: he betrays this in mentioning Senn's death the year before. Perhaps we should not read more into this brevity than a single sentence can bear, but we must note, nevertheless, that Leopold Sonnleithner's brother Eduard had completed his education in Innsbruck and both of them had a close relationship with the Tyrol, particularly through Joseph and Aloys Fischer in Landeck. We shall soon read more of the role of Aloys as the particular friend and helper of 'the poet Senn'. The 'circles' around Schubert were not at all homogeneous. Sonnleithner, himself very musical, belonged to the group of the musically passionate friends. He was a child of a respected Viennese family; he had money, an education and a career in the Empire of Paperwork; in marrying Louise Gosmar he married into even more money. Senn was in many ways the polar opposite of Sonnleithner. He seems to have had little interest in music; he scraped along on subsistence gleanings and never had the slightest prospect of a bureaucrat's career; his fiery interest in ideas made him dangerous and unpredictable; his doom at the hands of Sedlnitzky's troops would have put the black spot on him for respectable careerists in Viennese society such as Sonnleithner. The laconic Sonnleithner knows all about 'the poet Senn', his arrest and subsequent doom, but chooses not to mention it, even in 1858. Schober never fails to surprise even those who have lost many useful hours of their lives that they will never get back by reading our potted biography of him. In the years before Senn's arrest Schober, with Schubert, was one of Senn's closest intimates. After Senn's arrest Schober kept in touch with him, even visiting him. But Schober, who knew so much yet never engaged in the energetic pursuit of contemporaneously documenting those times, has now moved on: Senn has been dead nearly 20 years and Schubert nearly 50 years. We'll get no more out of Schober. The German Wars of Liberation 1813 to 1815 left behind an important intellectual uprising, even in Austria. Among other things, in Vienna, a splendid and companionable circle of young writers, poets, artists and intellectuals simultaneously came together almost instinctually and without prior organization, a circle the likes of which the Imperial City had never seen before and which, after its dissolution, spread the seeds of the future in all directions. In this circle Franz Schubert composed his songs, which later through Liszt achieved European renown. Stepping back out of our current preoccupation with this period, it would now be difficult for a non-specialist to name any member of the glittering circle of this 'important intellectual uprising' apart from Schubert. Senn mentions one or two who rose to high positions in government, but they are also unknowns who had no appreciable effect on anything. We shall come back to this extensive theme another day, but this spontaneous Austrian 'uprising' – if indeed it ever existed – had no historical effect at all, let alone 'spread the seeds of the future in all directions'. Senn, contradicting himself, admits tacitly that even Schubert, the giant amongst these dreamers and dilettantes, might have remained largely unknown had it not been for Liszt's efforts. In this context we hear the voice of Schober, who made himself Liszt's amanuensis for a period of about ten years (c. 1840-1850) and who was still associated with him at the time that Senn was writing this piece. Senn describes the shattered hopes and the disappointments of the era for his generation. These expectations were fulfilled here and there, and we could look forward to their complete fulfilment with confidence. We rested on laurels and roses and gave ourselves up to illuminating contemplation and the life of the mind. In the proud awareness of secured rights we wanted to grant ourselves and others some importance. Freedom unchained the soul to become spirit, turned humans to gods and Olympus descended to those places where free humans gathered. But oh – what a disappointment! The promises still outstanding were withheld, those already granted were withdrawn or withered, trust was betrayed. The places of the earth became prisons and humans their inmates. The contempletive godlike life was over, the only things left were complaint, resignation and a manly bearing in the face of the loss of the beautiful future. Unfortunately, his poems give us little insight into the times: the lives and thoughts of many of the key members of that generation remain in the surrounding darkness. After I had educated myself in this institute [Konvikt] up to the point where I was able to give private lessons, I left the institute, took my examinations as a teacher and supported myself with private teaching. We hear Senn's essentially egocentric view of the world come through clearly in his use of the phrase 'I had educated myself' – his teachers clearly being irrelevant dullards. Let's be fair though: this account is being written for the enlightenment of Graf von Sedlnitzky and his policemen – Senn is clearly going to try and avoid incriminating anyone. After completing his gymnasium school courses he turned to the study of philosophy, carried on as a genuine 'Faust personality' the study of Jurisprudence and Medicine for five full years up to 1820, all the time supporting his meagre existence with private lessons. This chronology makes some sense. 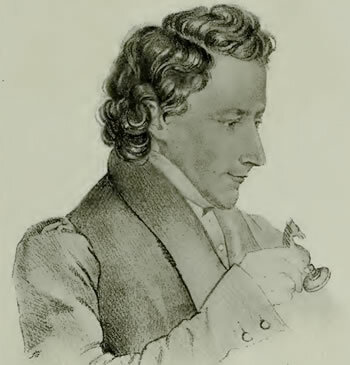 By 1815 Senn would have completed his six basic school years – four 'Grammar', two 'Humanities' – and the additional two years – 'Philosophy' – he needed for university entry. But if we accept the timeline as being accurate there are some consequences. Senn did not leave in 1813 in solidarity with the Tyrolean rebels. Schubert left the Konvikt in 1813. In order to teach at his father's school he took the teacher preparation course at the Normal-Hauptschule, passing the final examinations on 18 August 1814. [Deutsch Dokumente 33]. Presumably this is the type of course that Senn took two years later in 1815/16, which our intellectual giant renders as 'took my examinations'. It would have been amusing to see the two ex-Konvikts, Schubert and Senn, side by side on the school bench learning their teaching trade, but unfortunately the dates rule this out. Nevertheless, teacher education is one common factor between the two young men. The police noted that Senn 'wanted to stand alone in the world and rely on himself and his brains for his existence.' That would turn out to be not enough. And we know what happened to Faust. After all this pondering and debating we are still left with just the three shared points in the Schubert/Senn biographies. No gaps have been filled in. We are no wiser about their time together in the Stadtkonvikt. We know nothing about the relationship of the two young men up to the moment of Senn's arrest. We have a Schubert biography the surface of which is music, performance and entertainment in the circles of music lovers. Underneath this is a stratum of conversation with others – and Senn in particular – about which we know next to nothing. 'We rested on laurels and roses and gave ourselves up to illuminating contemplation and the life of the mind.' The police raid on Senn's apartment in February 1820 momentarily tore apart the musical Biedermeier surface to reveal our composer in the non-musical company of the law students Senn and Streinsberg. We can only assume that the conversational substrate, the 'life of the mind', stayed completely oral – under Franz's belljar the rule was: write nothing down. There are many activities of the Schubert circles that we have left untouched because – as far as we know – Johann Senn was apparently not directly involved. These include the Unsinngesellschaft, the Beiträge zur Bildung für Jünglinge and the creation and selection of texts for Schubert's compositions. In the last two decades the detailed cultural and political interrelationships among the Schubert 'Circles of Friends' have been the subject of some scholarly interest. We may return to this subject on this blog someday, but the impatient reader with good German should consult [Aderhold], [Dürr], [Kohlhäufl, Bewußtsein], [Melkis-Bihler], [Otto]. [Kohlhäufl Vaterland] is a monster work displaying all the virtues and the vices of a German doctorate and thus is only suitable for professionals. [Dürhammer] is unreliable and erratic.